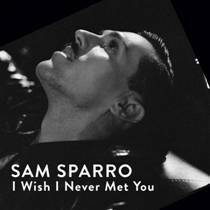 Sam Sparro will release his new single ‘I Wish I Never Met You’ on 4th June. The single is the first to be taken from his forthcoming sophomore album, ‘Return To Paradise’, released on 11th June. Part soul crooner, part pop star with an ever-morphing, chameleon-like quality, Sam coasts a fine line between disarmingly earnest and a chic, credible cool. Signed to EMI Australia in December 2011, Sam has spent the last couple of years working on the follow up to 2008’s eponymous debut release. With a Platinum single (‘Black & Gold’), a Gold album, a Grammy nomination and five Arias under his belt, he’s also been busy collaborating with the likes of Mark Ronson and Basement Jaxx as well as writing for other artists such as Natasha Beddingfield. Sam’s new album is a play on nostalgia and “paradise garage” – a genre derived from the hedonistic discotheque scene in New York in the late-70s that began in a parking lot giving rise to the term “garage” famous for its unique and eclectic style of disco and dance music. It has been co-produced with long time collaborator Jesse Rogg. The central themes are love and loss and the quest for inner joy and happiness. “A lot of the songs are about me trying to find my sense of innocence and peace of mind and things that I felt had escaped me for a while”. Whilst drawing on influences from the ‘70s and ‘80s the album is very contemporary with a modern take on these themes. During the process of making this album Sam says he tapped into a new found confidence to become a more prolific song-writer and generally more self assured.